(CNN) -- A commuter airliner that crashed Thursday in upstate New York, killing 50 people, underwent violent pitching and rolling seconds before impact, with passengers experiencing twice the normal force of gravity, a federal investigator said Sunday. Only a few pieces of the Continental Connection Dash 8 turboprop were recognizable after the crash. The plane's final 800-foot fall took five seconds, Steve Chealander of the National Transportation Safety Board said. 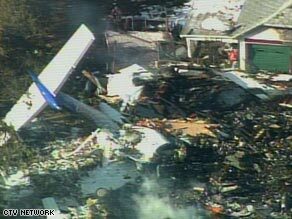 The aircraft crashed into a home in Clarence Center, New York, near Buffalo, on Thursday night, killing all 49 people aboard. A 61-year-old man in the house died also, but his wife and daughter survived. Final motions of the aircraft were so drastic that the plane's autopilot automatically disengaged and warnings sounded, Chealander said, citing information from the plane's flight data and cockpit voice recorders. Also, a "stick-shaker" device, which noisily vibrates an airplane's controls to warn the pilot of imminent stall, kicked in, he said. Chealander said the plane's de-icing system was turned on 11 minutes after the flight left Newark, New Jersey, for Buffalo, and remained on for the entire flight. He said the pilots were told before departure from Newark that there was "light to moderate icing" in the Buffalo area but that no other pilots had reported problems with their landings at the Buffalo airport. "It was really not a bad-weather day, and they chose to launch [from Newark]," Chealander said of the pilot and the first officer. "You're encouraged to use the autopilot to help you with the workloads of these high intense weather situations that we fly into all the time," he said. He said the NTSB in the past has recommended to the Federal Aviation Administration, which oversees civil aviation including commercial airlines, that in severe icing conditions, "it might be best to disconnect autopilot so that the pilot might have a better feel" for the aircraft's conditions. However, severe icing is "not what we saw here," Chealander said, adding that the FAA has no such disengagement rule in effect. "To say that they should not have been flying on autopilot is not correct," Chealander said. The pilots' recorded remarks about "significant" icing did not indicate "severe" icing, he said. The NTSB has said problems for the 74-seat Bombardier Dash 8 Q400 occurred when the pilots lowered the landing gear and tried to set the wing flaps to slow the aircraft for landing. Offering more details, Chealander said Sunday that the plane's nose pitched up 31 degrees, then down 45 degrees. The aircraft rolled left 46 degrees then right 105 degrees, or past the 90-degree vertical point, he said. Chealander said the NTSB's investigation of the crash site indicated that the two propellers on the turboprop aircraft were in place when the crash occurred. "The airplane hadn't lost anything prior to impact. It came down intact," he said. Meanwhile, local authorities working to recover remains of the victims said Sunday that a federal team of more than 40 people using some $2.8 million worth of scientific equipment would begin on Monday to help establish positive identification of the victims. But because of the intensity of the crash and a subsequent fire, "whether we can identify everybody or not remains to be seen," Erie County Health Commission Anthony Billittier said. Authorities had recovered 15 bodies as of Saturday night, but Billittier announced Sunday that numbers of recovered bodies will no longer be released "out of respect for the families."